Never place room temperature specimens in a box with ice packs or ship with refrigerated specimens. Microbiology specimens may be placed together in the same plastic Transport Bag. Test Tubes (blood specimens) may be placed together in the same plastic Transport Bag. 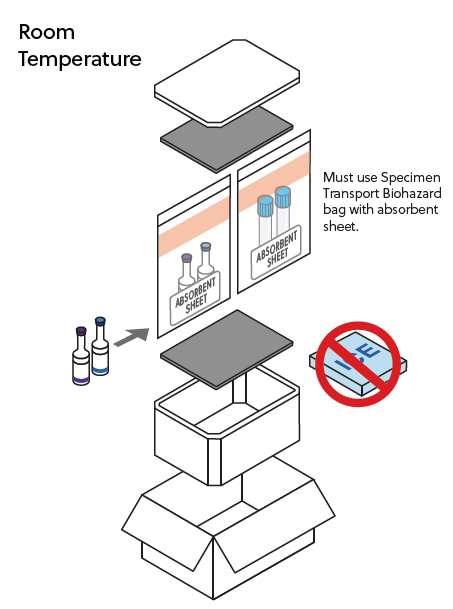 You may ship room temperature microbiology specimens in the same box with other room temperature specimens (such as test tubes) as long as they are bagged separately.